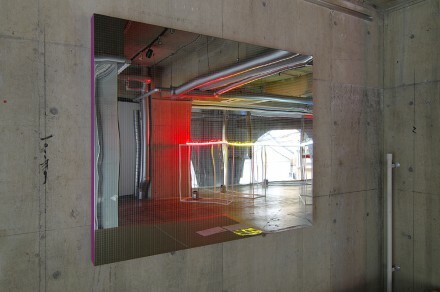 Born in Kyoto in 1974, a graduate from Seian University of Art and Design, Takashi Kunitani began to make installation work with neon glass, which is unique in that most artist don’t create their own. He has used different materials to create many unique conceptual works. Kunitani’s fundamental interest and concept involves the “transformations of our conscious world which are brought about by the relationship between humans and space”. To re-build, to re-cognise and to re-mould the world and consciousness in the space between his work and viewers. Engraved mirror grids of Kunitani’s Mirror Site series are based on the idea of nested structures. The viewers react and recognize themselves and the world which is reflected by the image of the landscape and body in the mirror, and they appear to undergo a faint distortion caused by the lines of the grid. In this exhibition, Kunitani develops a constructive and creative way to include interactive elements which can be acted upon by the viewer. According to the artist, “each person’s sense of existence is established through the movement and placement of objects…my exhibits are brought into existence by the experience of the viewer and completed by the participation of the viewer.” Kunitani’s new work, Mirror Site – LEGO, attempts to invite viewers to consider the relationship between themselves and the installation within an ever-changing environment.